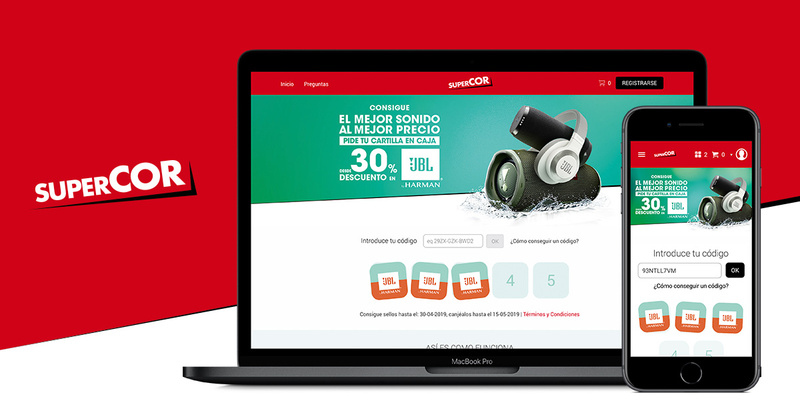 Spanish supermarket chain Supercor launched its online activation platform for web. Their first savings program starts with JBL as their partner. A multidisciplinary campaign with an online & offline promotion. It only takes 5 stamps to complete a savers card and earn a discount on a selected assortment from JBL. Purchase for 10 Euros or refuel for 30 Euros at Supercor, Supercor Exprés, Opencor and Stop&Go and receive 1 stamp with a code & logo. These double value stamps are valid as well for the instore offer as for the online campaign. Enter 5 codes online and you have completed your digital card, which gives you over 30% discount on selected JBL products in the online shop. Supercor also has a special offer for the JBL GO2 product, only available instore. The double value stamps are also valid for this instore offer and can be collected with a physical stamp card. Bring music wherever you go with JBL’s top notch wireless speakers, headphones and kids assortment. Check www.supercorjbl.es for more information about the savers program.